Sri Muthuswami Deekshitar merged with the Ambal on a Deepavali day which dates back to 21st October 1835. Thought of sharing his composition “Ekaamresa Naayakeem”. In this song Deekshitar praises the greatness of Ambal Ekamresa Nayaki, the one who is the Consort to Lord Ekambreswara. The Lord Ekambreswarar temple is situated in the holy town of Kanchipuram, one of the seven Mokshapuri. This temple is one among the Pancha Bootha Sthalam representing the element Earth. This is one of most ancient temples in India dating back to atleast 600 AD. The Pallava and Chola Kings have contributed significantly for this temple. 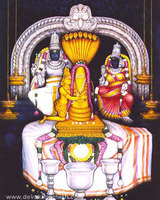 Lord Ekambara Nathar is praised by the four saivite saints, Thirugnana Sambandar, Thirunavukkarasar, Sundarar and Manickavasagar. This is the first Lord Shiva temple in Thondainadu region praised in Thevaram and Thiruvasagam hymns. The Legend of the Sthala Purana says that when Lord Shiva was deeply immersed in the task of creating, protecting and destroying the Universe, Parvati, his consort, in a jocular mood, closed his eyes. This resulted in staying the process of creation and destruction as well as obstruction to the natural law of things. It was a serious matter and Shiva became angry and cursed Parvati to go to the Earth and expiate her misdeed. Accordingly Parvati came to the banks of the river Kampa under a mango tree at Kanchi and made a Shivalinga out of sand and worshipped it. To test her sincerity Shiva placed various obstacles and hindrances in the way of Parvati`s penance. But with the help of Lord Vishnu she could tide over all the difficulties. At last Shiva hurled a deluge by taking out the River Ganges from his matted hair, to wash away the Linga worshipped by Parvati. Parvati devi prayed to Ganga and convinced her that both of them were sisters and so should not harm her. And so Ganga did not disturb her penance after that and finally Parvati embraced the Lingam and got united with Lord Shiva. The lord is also referred as “Tazhuva Kuzhainathar” (The one who melted in her Embrace). In the Anupallavi Deekshitar refers to Mooka Kavi. The legend is that there lived a boy in Kanchipuram, who was speech impaired from birth. He was regularly visiting ‘Kamakshi’ temple and was prostrating before the goddess. One day He saw the lips of the goddess and after that he started to speak and wrote a work called ‘mooka pancha sati’ or five hundred slokas in praise of the goddess. The word ‘mooka’ means ‘a person who cannot speak’ in Sanskrit, hence his name remained as ‘mooka kavi’. 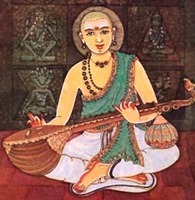 On knowing this attainment of speech by Mooka because of the grace of Kamakshi, the then Acharya of Sri Kanchi Kamakoti Peetam, Sri Vidyaghana, sent for the boy's parents and told them of his intention of giving sanyasa to the boy and, with their consent, gave sanyasa and ordained him as his successor as the 20th Acharya of Kamakoti Peetam. Such is the greatness of the Ambal, Kamakshi, Ekambresa Nayaki. Let us worship her and seek her blessings. Oh mind, chant the sacred name of Eeshwari, who is the consort of Ekaamresa. She bestowed voice to the dumb poet Mooka. She bestows salvation. She is the protector of Guru Guha. She resides in Kanchipuram. She is bestower of salvation. She is Nalini with slender waist resembling lotus stem. She dispels the evils of Kaliyuga. She illumines the universe. She is benevolent to devotees. She fulfills desires. She enchants the ever blissful Lord Siva. She is invoked by fifty mystic syllables. She is renowned as Kamesvari. Her eyes are beautiful like lotus flower.